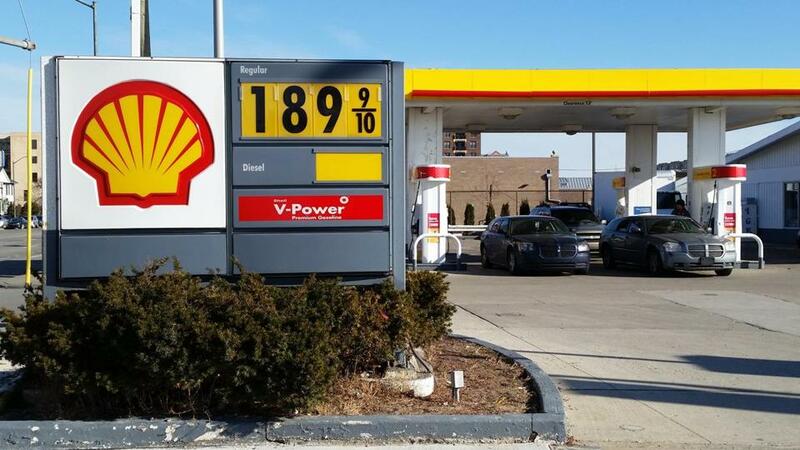 Falling gas prices are one reason why experts feel the economy will continue to improve. At the start of 2014, cold weather blanketed most of the country, chilling retail and auto sales, and dampening hiring. But the economy warmed after winter passed and heated up in the second half of the year as employers added hundreds of thousands of new jobs, consumers opened their wallets, and the stock market soared to new heights. Now, analysts are optimistic that the momentum will carry into 2015. “Everything is coming together for a breakout year,” said Mark Zandi, chief economist at Moody’s Analytics, a forecasting firm in West Chester, Pa.
Signs of the breakout have been increasing over the past several months. Just a few weeks ago, the Commerce Department said the US economy grew by a 5 percent annual rate in the third quarter, the strongest growth in more than a decade. US employers added 321,000 jobs in November, the biggest monthly increase in three years and the 10th consecutive month that job gains exceeded 200,000. The unemployment rate held steady at 5.8 percent. 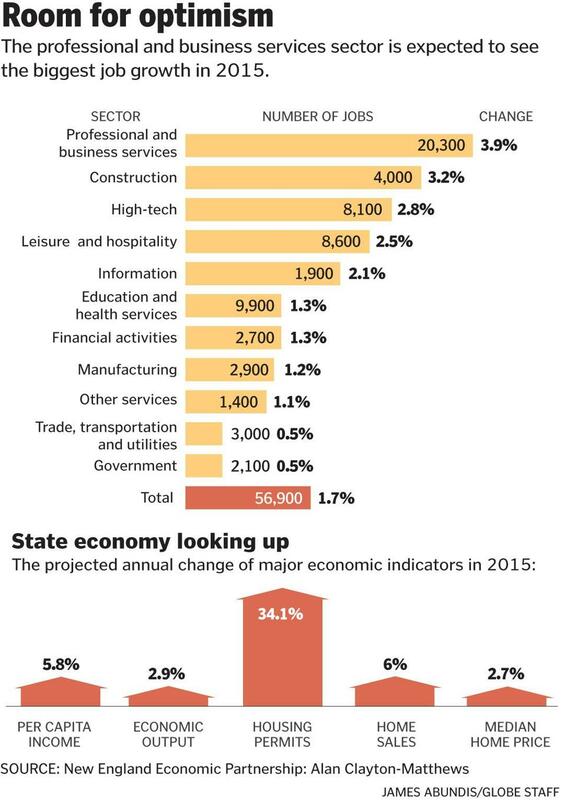 Massachusetts gained 13,500 jobs in November and has added 60,000 over the past year, putting 2014 on track to end with the biggest job gains since 2000. The state unemployment rate also was 5.8 percent in November. Eric Rosengren, president of the Boston Federal Reserve Bank of Boston, projects that the unemployment rate will fall to 5.3 percent nationally and 5.5 percent in Massachusetts by the end of this year. “If I were to pick a theme for 2015, it would be that this is the year the recovery feels like a recovery,” said Rosengren. That feeling, of course, has been long in coming. The recession ended in June 2009, and most of the past five years have been a long, slow, and painful slog for the US economy and workers. Even today, the long-term unemployed — those out of work for more than six months — number 2.8 million, according to the Labor Department. Another 2.1 million workers have given up job searches and are no longer counted as unemployed. Nearly 7 million are working part-time jobs because they can’t find full-time work. Those numbers, however, have declined significantly over the past year. Analysts expect wages, which have barely kept up with inflation in recent years, to increase as the labor market tightens. In November, the Labor Department reported a bigger than expected jump in worker’s average earnings. “Workers are going to start asking for bigger pay increases, and they’re going to start getting them in 2015,” Zandi said. 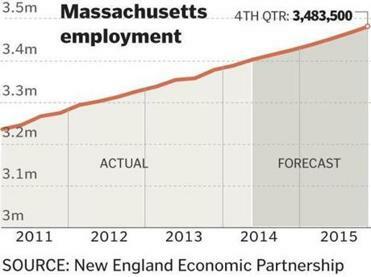 A recent forecast by the New England Economic Partnership, a group of regional and academic economists, projects that Massachusetts will add about 57,000 jobs this year and per capita, or per person, income will rise nearly 6 percent to more than $63,000. This is all helping to boost consumer confidence and spending — and that’s another good sign. Consumer spending, which accounts for about 70 percent of US economic activity, rose nearly 3 percent in the third quarter of last year, compared to the same period of 2013, according to the Commerce Department. Rising home values, soaring stock prices, and lower household debt are supporting consumer confidence and spending, analysts said. Consumers, meanwhile, are getting more help from falling gasoline prices, which have plunged more than $1 a gallon since the summer, both nationally and in Massachusetts. In 2015, falling prices could be worth the equivalent of a $750 tax cut per household, said Doug Handler, chief US economist at IHS Global Insight, a Lexington forecasting firm. Still, not everything is rosy headed into the year. Economic slowdowns in Europe and Asia paired with a stronger dollar could make business challenging for exporters, analysts said. In Massachusetts, exports account for about 5 percent of the state economy, said Alan Clayton-Matthews, an economics professor at Northeastern University. Business groups are wary, also. Associated Industries of Massachusetts worries changes to state law, such as an increase in the minimum wage to $9 an hour, will raise employer costs. Businesses are also concerned about soaring electricity rates and natural gas shortages in the state, the result of limited pipeline capacity in New England. “It’s fair to say this has the potential to put a damper on growth in energy-intensive sectors of the economy — manufacturing, trucking, and transportation,” said executive vice president Christopher Geehern. Edward Mason can be reached at Edward@EdwardMason.net. Find on him on Twitter @EBMason.